A great perk of writing articles for a pop-culture focused website is getting to check out projects you may otherwise miss. Mad Cave Studios reached out to us with some exciting projects they have coming. The first project they let us check out is a medieval fantasy comic called Battlecats. 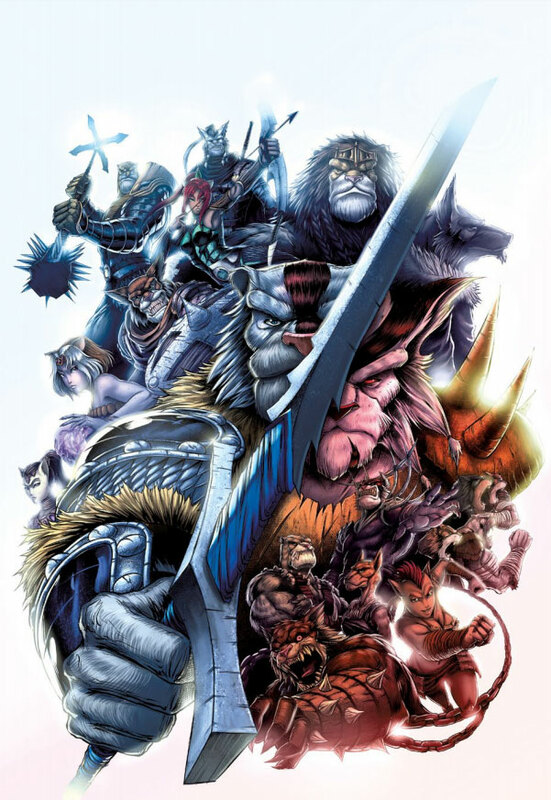 Battlecats follows a group of feline warriors. This small band of warriors all bring their own skills to the team. They begin a hunt for an infamous Dire Beast that had recently been plaguing their kingdom. The king that sent them on the quest hasn’t given them much meaning but the crew is dutiful and strong. The most exciting thing about reviewing this comic was receiving the entire first volume. 150 brilliantly colored, beautiful pages. I loved getting a chance to complete the story all at once. The entire first volume is available for sale at the time of this writing. If you’re into fantasy comics I recommend you do. The comic jumps into the story straight away. No exposition and no lengthy text pages to get you up to speed. This gets the reader into the action quicker. Brief, well crafted, dialogue gives you enough information about the Battlecats. Then the action kicks off. The panels, framing, and effects are well utilized. There is enough gore to sell the battles while still keeping the book safe for young teens. The book is very heavy on the action making for an exciting, and fast read. The story starts strong and the pace keeps up. By the fourth book the story gives you a chance to catch your breath. You are treated to the backstory of the Battlecats’ world. Starting with their creation and religion. The story of their first king, Eramad could and should be a fully fleshed out comic story in itself. This break in the action doesn’t feel like an intrusion or separation from the core story at all. Comic books being such a visual medium means the art is the first thing that can make or break a book. ‘Don’t judge a book by its cover’ is a tough sell in the world of comics. Luckily for the creative team at Mad Cave studios their cover art is astounding. Diving into the book itself the art holds up very well. The books are digitally colored. The artists seize on the medium to play with light, shadows, and atmosphere. As the story progresses the art is so well intertwined with the writing that the pages come to life. In our world of lazy animation and horrible rehashes Battlecats stands above. Dialogue in comics is a tricky undertaking. If it’s too little the story may get lost. Too wordy and it might as well be a novel. The dialogue in Battlecats flows well. Conversations between characters are minimal. A group such as this would already know a lot about each other. The absence of nonsensical exposition helps move things along. More importantly, it shows the strength of the writing where it’s needed. It reads like a story that the writer had no problem slashing his words down to the core that’s needed. As a further prop to the writer the comic relief character, Mekkar won’t grate on you. Through the five books that make up the first volume every character shines in their own time. I had a lot of fun with this book. I love quality world building. Especially when it unfolds naturally and lets you figure it out even more. Star Wars is an exceptional example of this. We have a complete galaxy that is very used and lived in. It wasn’t all shiny and chrome. The sets feel authentic even though it was a small fantasy movie done before the technology caught up. I’ve been told I’m harsh on judging comics. I’m a big fan of superheroes and a big fan of what Marvel has been doing with Star Wars since Disney took over. I can’t think of more than one fantasy comic I’ve read before Battlecats. That being said, I really enjoy this book. I read all 150 pages in a single sitting. Mad Cave Studios has more books coming out way, if the quality rivals Battlecats I am excited to continue. 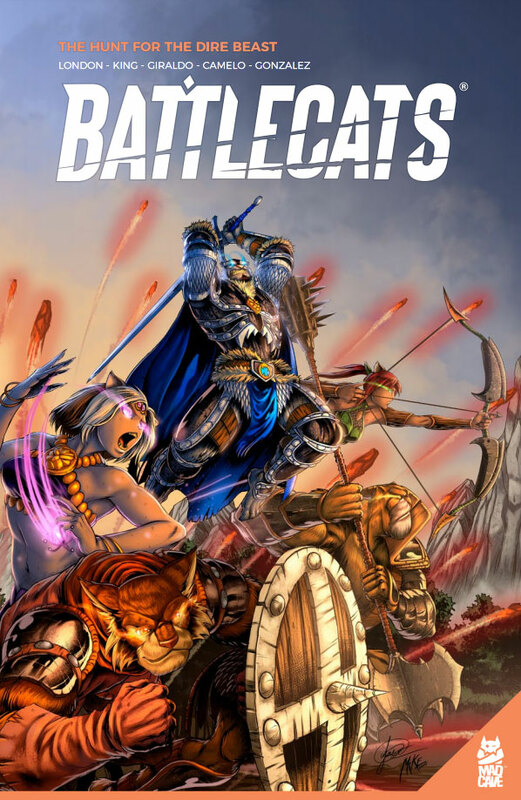 Battlecats is a medieval fantasy adventure comic about a group of chosen warriors that are trained from an early age to protect the mandates of the Lion God, the realm, and the crown. This first arc takes them on a quest to slay the legendary Dire Beast. The target audience is fantasy readers who are into RPG’s or tabletop games like Dungeons & Dragons and fans of lush world building. Also, fans of old cartoons from the 80’s and 90’s that are playful while still having an edge.